We did the research to help you find the companies that are making the best fishing rods right here in the USA. Below are our findings, along with the factors that we considered in our analysis. If you haven’t yet, also check out our research on fishing reels. Overall, we found 7 brands that are making incredibly high quality, American fishing rods. Brands like Winston Rods, Falcon HD Rods, and G. Loomis really stood out, among others. Below, we’ve divided our recommendations into several popular categories – everything from fly rods, to spin rods, surf casting, and more. Check them out below! We dug deep to really compare all available options and see which are best-suited to specific tasks. During this comparison, we separated rods into different categories to make sure we were comparing like products. We’ll help you find the best casing rod, the rod that’s best suited for saltwater fishing, rods for lightweight fish, and rods designed for the heavyweight monsters. Below are a ton of details about each of our recommendations, along with what we liked and didn’t like about each one. R.L. Winston makes it a priority to make their rods locally and support their community in rural Montana. Their Winston Rods are great for fly fishers around the world. We love the way that the Winston rods feel during casting. They feel a bit more accurate and are a whole lot smoother compared to most other rods we’ve tested in the past. This is because Winston Rods are designed to flex just slightly more than a typical rod does. This added flex protects more delicate tippets and creates that buttery smooth feel during casts. Winston rods offer excellent action and control as well, giving you complete power back just a split second after casting. You’ll love the control that you have using this rod, and that’s mostly because it’s designed to go back to straight faster than a typical rod does. 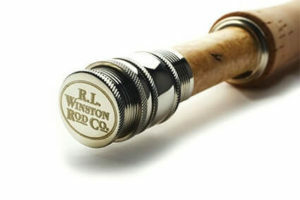 Winston rods also have top quality cork handles and a tough protective finish that’s known for lasting for years. Thomas & Thomas has a reputation for making high-quality fly fishing rods, and the Exocett is one of the best products the company has to offer. This rod is crafted for lightweight precision and it’s a real pleasure to use for saltwater fly fishing. We love that this rod is made from graphite with a multi-modulus design. It’s built to hold up to years of heavy use and won’t suffer from corrosion like some other rods. The Exocett comes with black RECoil snake guides and a four-piece construction that makes it easy to transport. It’s a solid saltwater performer and will quickly become one of your favorites. To top it all off, the rod also comes with an original owner lifetime warranty. Falcon HD rods are super versatile and one of the best values out there today. Each rod is made using a graphite blank and a Fuji guide and reel seat. We love how much control you have when choosing the deflection of the rod you want. There are four different deflection settings and you can choose from a slow to an extra-fast deflection depending on what sort of fishing you’ll be doing. Each Falcon HD rod comes equipped with a comfortable natural cork handle for maximum comfort and durability and they’re built for long-term performance. These rods are mid-cost rods that offer excellent casting and stability during standard fishing trips. 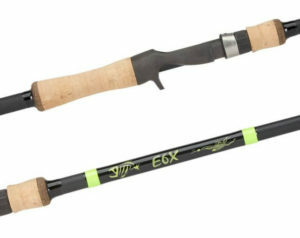 For bass fishing specifically, we were really impressed by the E6X rod from G. Loomis. This rod is designed for versatility and to provide just the right action for catching bass. If you don’t like the jig and worm configuration, the E6X rod comes in a few different varieties, each one performing a little differently. G. Loomis uses different scrim positioning and taper adjustments to create specific actions for different fish types. We prefer one of the fast-action rods from G. Loomis because they function surprisingly well and give consistent results when trying for bass. The rod comes with a cork handle and it’s very affordable. 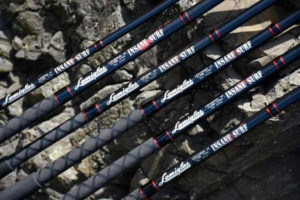 The Lamiglas SI series of fishing rods are some of our favorites for salmon and steelhead fishing. These rods are lightweight with a sensitive action, but they’re durable enough to withstand heavy pulling in most freshwater fishing situations. We love how sensitive these rods are and how simple it is to feel what’s going on down under the water’s surface. Each rod is designed with a top-quality Fuji SK2 reel seat, and they are fully made in the USA. We prefer these rods for mid-weight freshwater fishing, and they’re tough enough to tackle most waters well when paired with a quality reel. The Lamiglas LIS II MHS surf rod is an affordable saltwater solution that’s designed to hold up to heavyweight fish. We love how lightweight this rod feels in the hand (which we were surprised about, given its toughness on large fish), thanks to its tough graphite design. This beauty features K-frame guides and comes with an X Flock handle as well. It’s well-suited to long-distance casting and is simple to aim with. This rod is surprisingly affordable for a Lamiglas product and for being made in the USA. It’s protectively coated against corrosion and show be a long-term performer for many years even out on the ocean. Tidemaster is a well-known American fishing company that specializes in fresh and saltwater rods. We really like the Inshore casting rods collection thanks to their premium design qualities and more affordable price tag. Each of the rods in the collection features hardened aluminum oxide guides that are built to fend of corrosion while standing up to long-term use and abuse. The Tidemaster Inshore casting rods come with a Fuji reel seat and they feature a comfortable natural cork handle. We love the 5-year warranty that comes with every purchase. Each of these rods is protected with a Flex-Coat outer layer to really keep corrosion from being an issue. Finding a local dealer can take time though, making this rod a bit more difficult to order than others. The action of a fishing rod largely determines how it’s going to perform. Often, a slower and more defined action is best for larger fish, while a light and quick action is best for smaller fish. Winston rods in particular are known for having a wonderful action, but when comparing rods, we looked at how quickly the action springs back to its original position as well as how much the rod is allowed to deform during use. 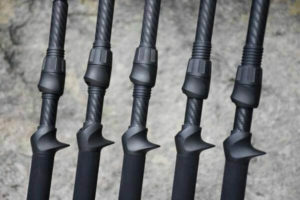 High quality rods travel farther in less time than standard rods do. The reel seat, or the location where your reel is attached, is one of the most crucial parts of any fishing rod. We looked closely to make sure that a top-quality seat is being used and that whatever rod you purchase is going to hold the reel you need for many years. A good reel seat offers a good stiff hold that will eliminate any wobbling of the reel during use. A quality seat is also contoured and built for comfort so your hand can remain comfortable while landing a fish. Cost is an important factor when choosing any fishing rod. We don’t look for the cheapest rods, or the most expensive available. Instead, we make sure that the quality of construction and components lines up with the cost of the product.